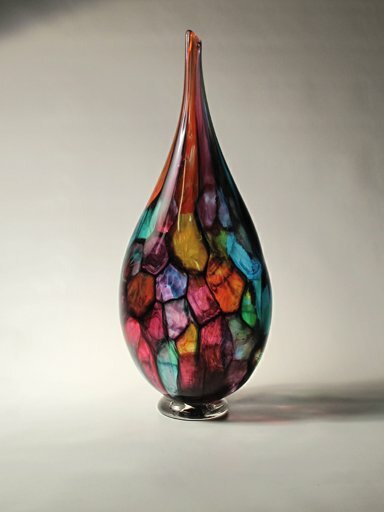 Art Ciccotti is mostly self-taught as a glassblower. Over the years he has attended workshops around the U.S., learning techniques and honing the skills that fuel his passion for this ancient craft. His current designs have roots in Venetian glass working techniques. The use of a roll up of glass (tocar pierre) allows him to put together designs that can vary from the random composition of a Garden Walk Platter to a very controlled design using cane and murrine. Bright colors and curvilinear forms are the design elements he prefers to work with. He enjoys exploring new color combinations, shapes, and functionality. As his skill level increases so does the complexity of the designs and techniques. He is not sure he can say that he has a favorite thing to make. Usually whatever he is making at the time is his favorite thing.